Ahhh. I’m here. Campsite 25. 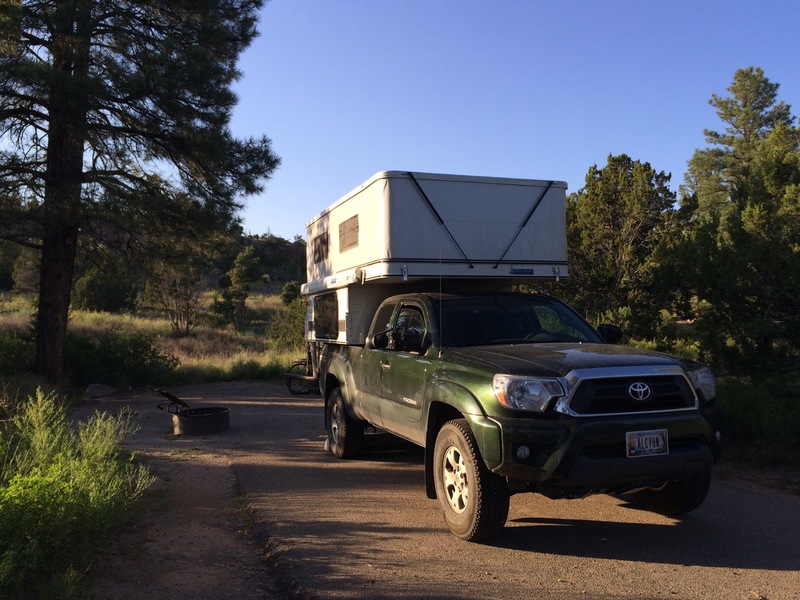 Juniper Campground in Bandelier National Monument. It’s 7 pm. The camper’s popped up on the truck. The glass of white wine beside me is cool and beckoning. 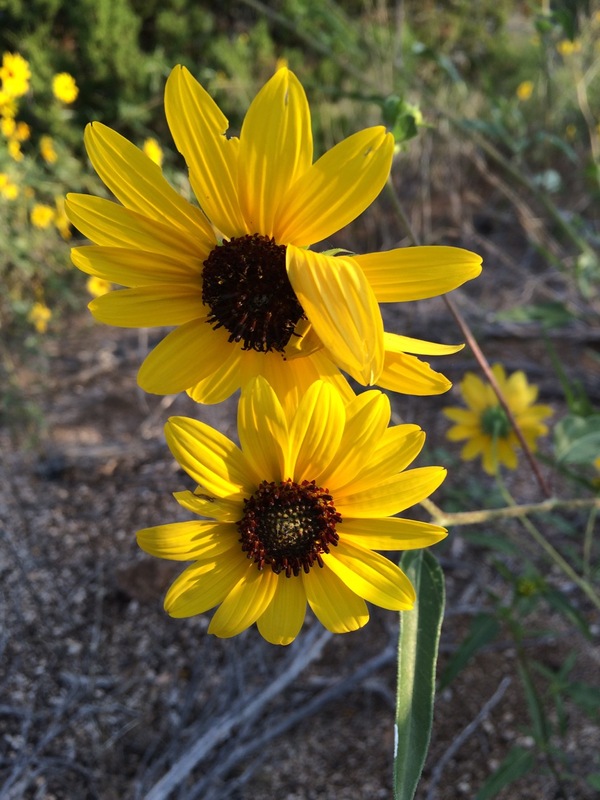 The setting sun sifts through the juniper, pinyon, ponderosa, the ripened red currants and gleams upon the wild New Mexico sunflowers. They light up the color of joy, a bright laughing yellow. A breeze sighs through the evergreen needles. Goldfinches twitter. A hummingbird hovers. To get here, I did not just swing into Juniper Campground and into this loop and land at this campsite. Picking the right site is serious, or you might say seriously fun, unless exhausted. Even then, I think you have to buck up and do it right. That means checking out a few options, or even better, all the options. 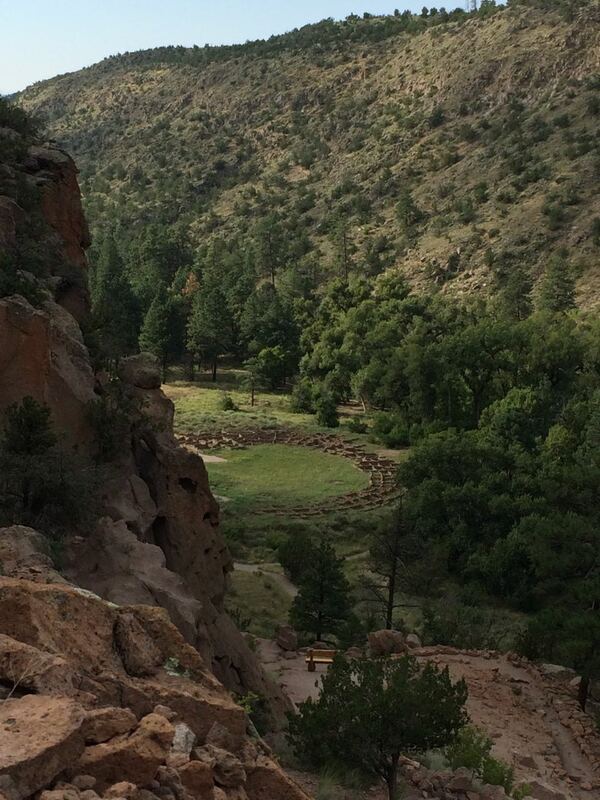 The next morning I would descend into Frijoles Canyon where the ancestors of Pueblo peoples inhabited the cliffs and the valley floors –likely heeding the orientation of the sun, the flood potential of the river, and avoiding best soils for growing corn. They lived in communal quarters, yet I’m sure there were plenty of options for solitude too. And they also likely left the canyon at times to harvest berries and gather pinyon nuts on this plateau, so they too might have thought with care about the right campsite. The first loop called Abert’s Squirrel seemed sweet enough. 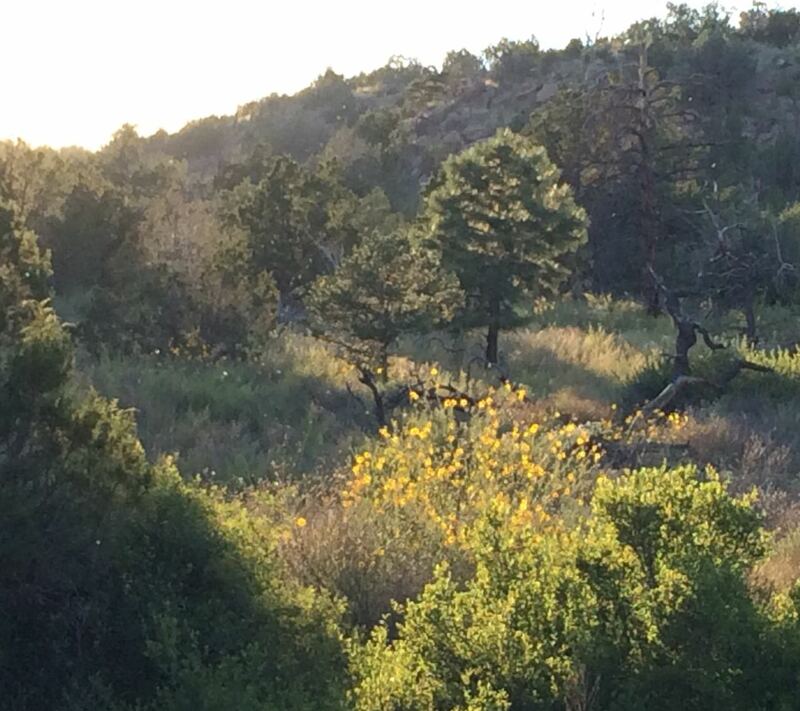 Well-spaced sites with picnic tables scatter among juniper and pinyon that unfortunately provide little shade. About half were taken and at the very end, I eyed an empty one that framed a field of sunflowers. I parked in campsite #8 and took stock. While free of fellow campers on either side, two sites away, three young men were hauling out a serious load of gear from a full-size pickup. A bit disconcerting. Party ahead? I pulled my bike off the bike rack, hopped on and toured the remaining two loops —Black Bear and Coyote. Not surprisingly, most campers flock sheep-like to the first available area. In contrast, I saw only two parties camped in the Black Bear loop of a dozen sites. Here, a few ponderosas shaded some of the picnic tables and a low sandstone cliff framed the west. Quiet. Perfect I thought and noted campsite #25. However, when I continued into Coyote loop, the ponderosas increased in number and in size, even some with the red-gold bark that would carry the scent of vanilla. Mmmm. At the far end, I picked what appeared to be the ideal spot —level for ultimate sleeping, with a few larger pines and views of an enticing sandstone canyon that seemed to beckon an exploration among ancestral Pueblo spirits. Decision made. 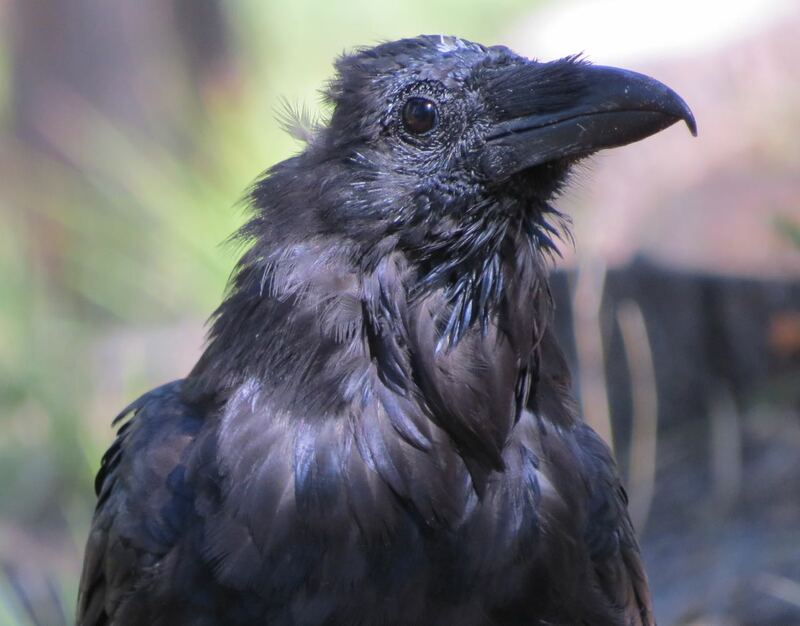 I pedaled back to Abert’s Squirrel loop, popped my bike onto the rack, jumped in the truck and drove on over, backed in, stepped out and…..the sound of a generator thrummed. There it was, three sites away, an RV. Could I live with it? The scenery was so spectacular, so inviting. I even liked that the restroom was within a short walk. I sat down at the picnic table and listened. Thrummmmm. Wait, I think I could hear another one. The only two RVs here had found their way into the back loop with the few sites large enough to accommodate them. No. I couldn’t do it. I drove back to Black Bear loop, parked, hopped on my bike to the pay station, came back and ahhh….this evening happy hour is fine. The sounds are the ones that nourish my soul —a cottontail hopping through the currant bushes and whooshing wing flaps of the raven passing overhead.